After you’ve taken care of the basic tasks of creating a crafting table and house, you can move on to the truly fun activities in Minecraft: explore, build, gather, fight, and engage in other outlets of invention. Following are some useful ways you can spend the rest of your daylight minutes. You can place the chest, which is a storage unit, in your world and fill it with items. The benefit is that you drop all items when your avatar dies, but not the items in the storage chests. Right-click the crafting table to view the expanded crafting grid. Confirm that you have at least eight wooden planks. If you don’t, chop down more trees, and then right-click the crafting table. Click the wooden planks to pick them up and right-click every square, except the center one, in the crafting grid. This arrangement is for crafting a chest. The chest appears to the right of the arrow. Click the chest to pick it up, and then click a square in the bottom row of the inventory to place the chest there. Press E or Esc to close the crafting screen as you would close the Inventory screen. Right-click a surface to place the chest there. If you right-click the storage chest, you can view an extra grid of squares that’s almost as large as the inventory. Placing items into these slots stores them for safekeeping. You can also Shift-click items to sort them from the inventory into the chest, and vice versa. Always keep most of your valuables in storage when you’re first starting out. As you become more comfortable playing the game, you can carry more items with you, just in case. Do not place a block directly above a chest, or else it won’t open. Placing a second chest next to the first one creates an elongated chest, which stores twice as many stacks in the same place for more efficiency. Cobblestone is a useful building and crafting material. 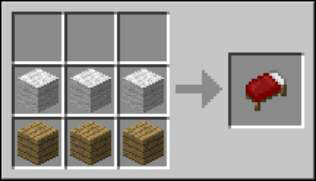 Obtain this item by mining stone (a common, gray block, also known as smooth stone) with a pickaxe. You can dig to find stone or look for a cave, mountain, or crag with a visible amount of stone. This information also applies to coal, the most common ore of the game, and how to obtain and use it. The figure shows several basic stone- and coal-based items, such as stone, cobblestone, and coal, and also stone tools, a torch, and a furnace. The following list explains how to obtain these items. The Stone tool is crafted in the same way as wooden tools, except with cobblestone rather than wooden planks. Stone tools are faster and have twice the durability of wooden tools. Also, the stone pickaxe can mine lapis lazuli and iron ore. The Furnace tool is crafted with eight cobblestone blocks. After you right-click the furnace, a new screen appears with two input slots and an output slot; place fuel in the bottom slot and an item in the top slot to cook the item. The Coal tool is used to craft torches and fuel furnaces. Coal can be found by mining coal ore, commonly found underground but occasionally aboveground. You can also cook wood blocks in a furnace to get charcoal, which has the same properties. The Torch tool can be placed on a floor or a wall as a light source. These lights are always important because darkness provides a place for monsters to spawn — and you don’t want them to appear in places where you need to go. 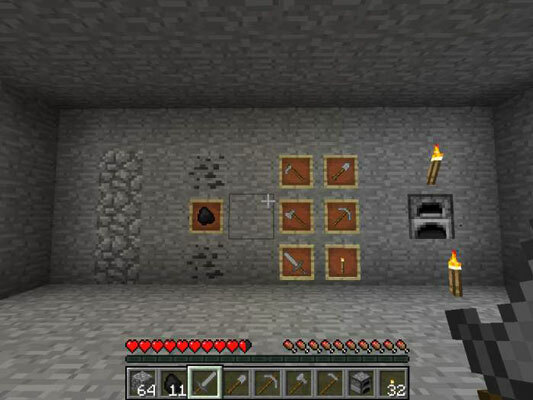 Use a stick and a lump of coal to craft four torches. The incredibly useful bed lets you sleep through the night — bypassing all its dangers — as long as you aren’t being pursued by monsters. To craft a bed, you need wool blocks, obtained by shearing or killing sheep that roam around grassy areas. Craft three of these blocks with three wooden planks to make a bed. Place the bed in the shelter and right-click it at night to sleep! You can only sleep at night. Wait until the sun sets a little more before trying again. You may not rest now; there are monsters nearby. You have to look for whatever creature is trying to kill you and destroy it before sleeping.